Before we get started talking about your writing, tell us a little about yourself, where you’re from, what you do for a living (if you’re not a full time writer), what hobbies you have, etc. Whatever you’d like to share. First I’d like to thank you for the opportunity to be featured on your Book Bench. That is special to me and I appreciate. As for me, I was a tax accountant and thought I’d work forever, but one day in the middle of tax season I decided I didn’t want to be there any more. Sold my practice in 3 days and a week later sold my building. Put it all in escrow and after we closed the doors April 15th there was a whirlwind of activity and I walked out of an empty building on May 1, handed over the keys at escrow and collected a big fat check. A higher power was in charge of that, it was amazing how it happened. Now I’m retired, happy beyond belief. I live on a wooded acre near the beach on the central coast of Oregon. Great place to live and to write. I also have a river house up the Alsea River and that’s a really magical place to write. My “start” was actually in newsletters, brochures and other business related documents at various places I worked. I hold a bachelors degree with honors and a Masters Degree, so even did some writing at the University. Eventually I became interested in fiction, having been a non-fiction reader only. Once I started falling in love with fiction, I itched to write but didn’t have the confidence for a long time. I tried writing short stories to apply all the lessons I’d learned about creative writing. I tried romance but it wasn’t that appealing to me. Wrote a few mystery shorts but I was really just dabbling. 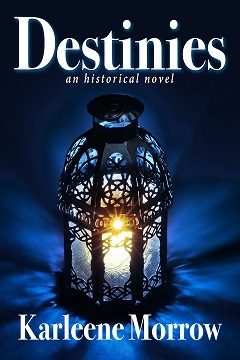 I was reading historical fiction and began to lean toward that genre, which is where I ended up with my first book, Destinies. I get almost giddy when my Muse appears. When the story is moving almost faster than I can type, when I’m hearing the story in my head as it travels to the keyboard through my fingers – those are the times when writing is total fun. They have to be every writer’s favorite times, I’d think. They are certainly mine. Getting started. That could be at the very beginning of a novel or sometimes at the start of a new chapter. Although I don’t buy into the concept of Writer’s Block, there are times when a story stalls. Then it becomes a matter of gritting my teeth, or opening a vein as writer William Brohaugh said years ago. At that point I have to sit down, place fingers on keyboard and push through – definitely my least favorite part of writing. 5. Where do you get ideas for your stories? The main idea for Destinies, the storyline, came while I was doing genealogy research, as mentioned above. I am at a loss though to explain where some of the characters and their fun stories and activities came from. The blacksmith, Doshinski, for example, just walked on stage and announced himself. I certainly had no plan for him at all, but when he showed up he made it clear he was there to stay. I have to pass the credit for those kinds of incidents to my Muse. I think he’s a prankster who likes to drop ideas and pictures in my head so that I have to scramble to act on them. My days all start with my half dozen Pomeranians who are so thrilled to see me they can hardly contain themselves. And they’ve just opened their eyes having slept on my bed all night. It always amuses me because one would think they hadn’t seen me in a week. They are all so adorable. Then it is getting them all fed on their healthy, raw diet and cleaning up the house enough. My husband was a head football coach and we had two terrific, sports active kids so I figure I’ve done my household duties for this life. My husband is up coaching God’s football team (and winning, no doubt) and the nest is empty now, so if the house is clean enough, that’s good enough. I go to the gym twice a week and do workouts on home equipment on the other days, I belong to a writing group of great writers who also excel in critiquing for each other as our novels develop. Our goal is for every member to get her work published. I purchased Scrivener’s but so far haven’t managed to get it up on screen to work through the tutorial. I thought when I retired I’d have all the time in the world, but now I have no idea how I ever found time to go to my office. I wish I could answer that. They are all on the easy side when my Muse is sitting on my shoulder. They are all difficult when he absents himself and I’m on my own. The Good News is that he always returns. At the top of my computer is this quote: The Muse proves more and more elusive the longer you await it. But it is remarkably available if you go to seek it every day and grab it by the throat. 8. Tell us about your next book & when it is being published? The next book is a beginning Work in Progress. The research has been time consuming just to get started since the setting, political scene and dialogue all have to be right or the book will get off to the wrong start. I have the basic storyline into MSWord and keep thinking that I’m ready to start Chapter One. That’s been going on awhile while I keep researching but I’m hoping I have it fairly wired now and will be typing on that blank page in the near days. This book is set in the period immediately after the Revolutionary War when the protagonist returns to his father’s Virginia plantation after the last battle. The main story is in the years 1781 and those following. The substory is set in the same area near present day Richmond Virginia. I call it a Time Warp story – Cort’s life more than two hundred years ago thinly intersects with Andy’s which is happening today. I know it is going to be a challenge. I’m counting on it also being fun. Links to KARLEENE’s website, blog, books, etc. Also available on Sony, Smashwords and other online bookstores. Available on Amazon http://amzn.to/VGUMDK & all major online bookstores. BE SURE TO COME BACK to read more about KARLEENE and her novel, DESTINIES, on Wednesday’s Karen’s Killer Book Bench!! Happy Reading! **SPECIAL ANNOUNCEMENT: Karleene will give away a copy of her release, DESTINIES, to TWO of her lucky readers who comment on either her Monday Interview or Wednesday Book Bench blogs!! Winners will be randomly selected and announced Monday, September 2, 2013. Thanks, Karleene, for sharing your story with us!